One of the most exciting parts about warmer weather is being able to enjoy your swimming pool. The least exciting part about warmer weather is having to clean your swimming pool. No worries, though, we’ve got you covered! After lots of research we’ve found the best pool vacuums for the money. They’re budget friendly and clean your pool nicely. So what’s the best pool vacuum cleaner? Let’s talk about what you need to know when buying and then jump right into the reviews. Vacuum Type: There are three types of pool vacuums. Suction side cleaners work with a dedicated line and attach to the suction line of your pool. Pressure side vacuums use the existing pressure sideline to move the cleaner. And robotic pool cleaners work on their own. 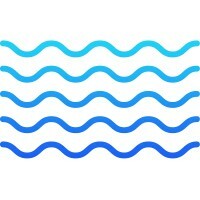 Pool Type: You will need to choose your vacuum based off of your pool type: in-ground or above-ground. In-ground vacuums are designed to work even in deeper water, but many above-ground vacuums work in both pool types. Check what the manufacturer says. Hose Length: When you are comparing pool vacuums, you will want to consider the length of the hose. The hose will need to be long enough for the vacuum to cover the surface area of the pool. 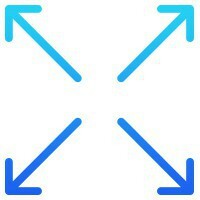 Longer is generally better, and we’ve listed the length in each review. Full Coverage: Coverage shows you the cleaning capabilities of a pool vacuum cleaner. Some vacuums are designed with the ability to clean the pool floor, walls, and coves. Some can only clean the floor and walls, and some can only clean the floor. More coverage is better. All Pool Surfaces: Different pool vacuums are capable of cleaning different pool surfaces. The best pool vacuum will be able to clean all pool surfaces. Ultimately, the vacuum should work for your pool, so pick one that supports either all surfaces or the material your pool is made of. Warranty: Lastly, you will want to look into the warranties that come with different pool vacuums which vary by length and coverage. If you’re worried about something breaking, you should look for a vacuum with a long warranty. This can change, so double-check. All right, time for the reviews! That’s what you’re here for, isn’t it? We’ve selected ten excellent products and can recommend a top pick and a budget pick. Sounds good? Let’s take a dip and find out which product is the best pool cleaner for you. The Dolphin Nautilus Robotic Cleaner is the best pool vacuum robot we've seen. Period. We love that this vacuum is lightweight and easy to use. Since it is a robotic vacuum, it has an electric cord rather than a hose, and the cord is 60 feet long. The length of the cord makes it perfect for cleaning in-ground pools up to 50 feet long. This vacuum cleans the pool floor, cove, and walls like the best robotic pool cleaner should. It is safe to use on all pool surfaces, and it can get all of the scrubbing, vacuuming, and filtering done in about three hours. You will love this vacuum if you are looking for a cleaner that will require the least effort. The filter cartridge can easily be cleaned, and you can simply plug in the vacuum and let it do its thing. It’s robotic, so no need to worry about connecting it to your pool system. The cord has a smart swivel, so you never have to pull it out to fix a tangled cable. We also were impressed with the self-programming of this vacuum which scans the pool and cleans it flawlessly. Lastly, the product comes with a one-year warranty for peace of mind. It’s an excellent choice! If you are looking for an affordable in-ground pool cleaner, then you will love the Zodiac MX8 Suction Side Cleaner. 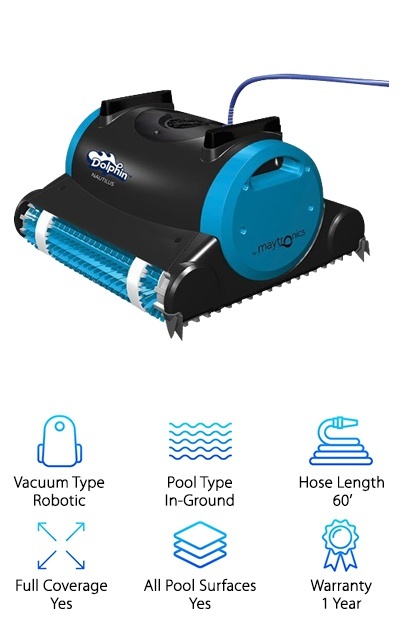 It is a budget vacuum that is perfect for in-ground pools, and it works on all pool surfaces including concrete, tile, vinyl, and fiberglass. The Zodiac comes with a hose that is 39 feet long, and it will clean the floor and walls of any pool shape. The hose can quickly be attached to the cleaner head by simply twist locking it. 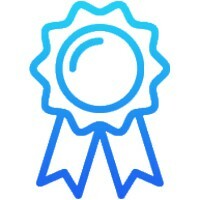 The product is covered by a one-year warranty. Besides that fact that this is a wallet-friendly option, we love that it gets the job done efficiently. It is able to provide serious vacuum power even with low flow from your pool’s system. Since it doesn’t pull on your pool’s filtration system as much as other vacuums, it is great for solar, two-speed, and variable-speed pumps. It also has a wide cleaning path that cleans evenly. Lastly, its tires give it great maneuverability and climbing performance. If you want to keep your pool clean on a budget, this is it. If you’re less concerned with a budget, you should check out the new Polaris F9450 Sport Robotic Cleaner. Though it’s going to cost you a little more money, you will be impressed by the advanced features. Since it is a robotic vacuum, it is powered electrically rather than your pool’s suction systems. The Polaris comes with a 60 feet cable, so it is capable of cleaning in-ground pools up to 50 feet in length. While this vacuum can only clean the walls and floor of your pool, it is capable of cleaning all pool surfaces. With all of that being said, you will love that this vacuum is able to capture over four times as much debris as some other cleaners on the market. It features awesome cleaning power to leave your pool looking beautiful. 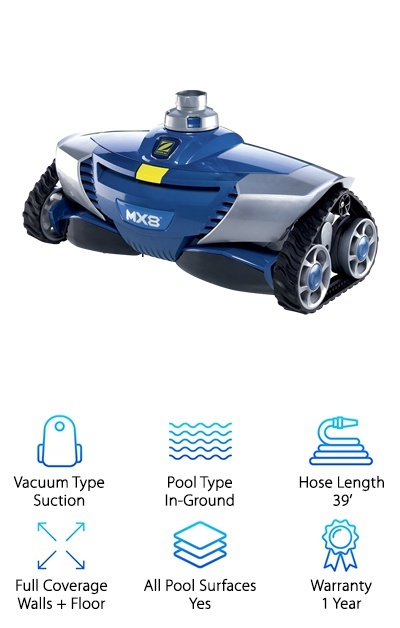 Our favorite part of this robotic pool cleaner is that it has a 7-day programmable timer. This means you can customize the cleaning cycle to meet your needs. Just plug it in and let it do its work, worry-free and week after week. When you are finished with it, it will allow for easy removal. We love it. 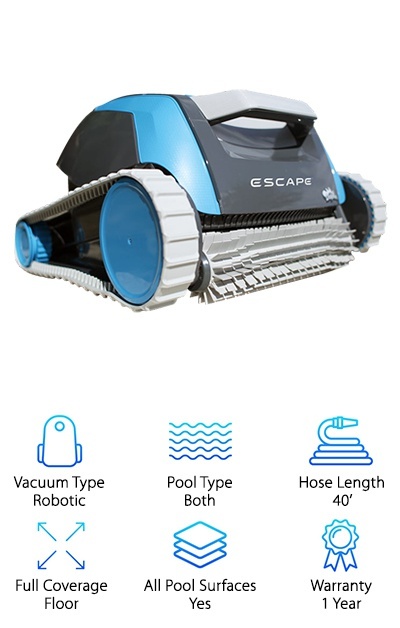 We wanted to make sure to include the Dolphin Escape Robotic Cleaner in our list because it is a great above-ground pool cleaner. However, it can also be used to clean an in-ground pool. Since it is a robotic cleaner, it doesn’t come with a hose, but it does come with a cable that is 40 feet long. If you are looking for a vacuum that will clean the floor, walls, and coves of your pool, check out our top pick. This vacuum only cleans the floor but does so very well. The Dolphin Escape Robotic Cleaner is safe to use on all pool surfaces so you can keep any pool clean of dirt and algae. We like that the Dolphin is lightweight and easy to use. It cleans your entire swimming pool floor by using robotic scanning, which serves as a guidance system, so it doesn’t miss a spot. It is powered by a 24-volt DC motor, for a fast and efficient clean. In fact, this pool vacuum can clean the floor of your pool in just 1.5 hours. Impressive! Lastly, this awesome above-ground robotic vacuum has a one-year warranty. The Smartpool NC22 Robot is a cheap robotic pool vacuum. As with most things in life, a budget option is going to have fewer bells and whistles, but it will get the job done. 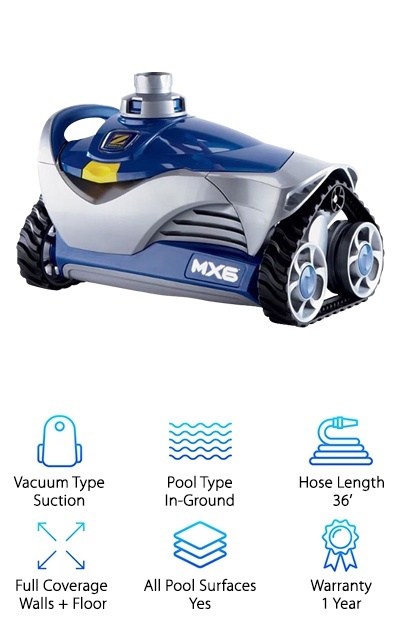 Though this vacuum was made for above-ground pools, you can use it is in smaller in-ground pools that aren’t deeper than six feet. 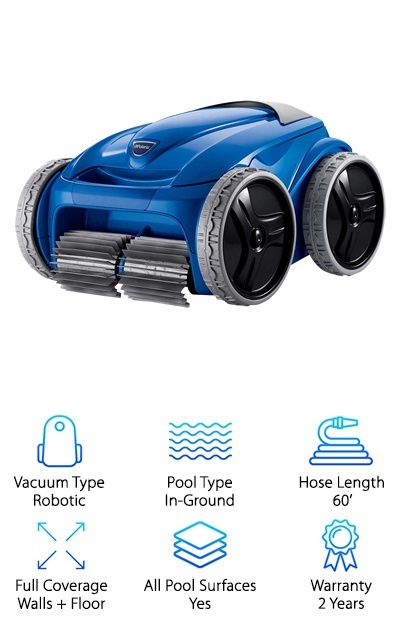 Since it doesn’t use a hose, the robotic pool vacuum comes with a power cable which is 40 feet long. It is designed to be used on the pool floor only, so if you want a vacuum for the walls or coves, you will want to look at our top pick instead. The Smartpool NC22 is safe for all pool surfaces, and it is covered by a one-year warranty. We recommend this product because it is both affordable and simple. Since it doesn’t have all the extras that make it capable of cleaning the walls and coves, it weighs a lot less than other vacuums. It even has a system to drain itself quickly so it can be easily lifted out of the pool. The best part of this vacuum is that you can start it up and go about your day without worrying about remembering to turn it off. This smart-navigation vacuum will shut itself off after two hours of cleaning at which point it should be finished. If you are looking for one of the best automatic pool cleaners, then you will want to check out the Zodiac MX6 Suction Side Cleaner. We love it for its price and versatility. It is a suction pool vacuum, which means that you will need to hook the hose up to your pool’s filtration system. You will want to make sure that the 36-feet hose will be long enough to clean your swimming pool. The hose has a swivel connection so the vacuum won’t get tangled. This suction cleaner is designed to clean the floor and walls of in-ground swimming pools. It is safe to use on all pool surfaces, and you will get a warranty card that is good for up to one year from your purchase. The vacuum was designed to be low-flow, so it is great for swimming pools that have either a two-speed or variable speed pump. Though it is very affordable, this vacuum is quite powerful. It can climb the walls of your pool effortlessly thanks to its articulating turbine blade combined with cyclonic suction. The bottom line is this: this suction vacuum will provide you with a lot of value for a low price. The iRobot Mirra 530 Pool Robot is one of our favorite robotic pool vacuums, but it is also one of the more pricey options. If you want a top-of-the-line vacuum regardless of the cost, you will certainly be impressed with the Mirra. Since this vacuum uses electricity rather than your pool’s water system, it comes with a power cord that is 60 feet long. Thanks to the gyro sensor in this vacuum, you will never have to worry about the robotic vacuum getting tangled in its own cord. The vacuum is designed to clean the entire inside of your pool. It is capable of cleaning the floor, walls, stairs, and everything in between. Its technology allows it to read the size of your pool and find the most efficient cleaning pattern. 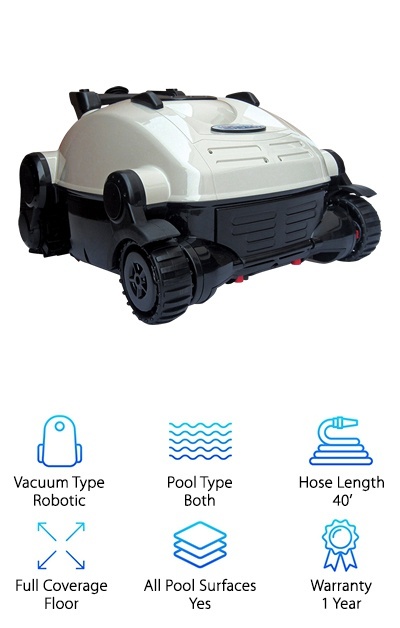 This vacuum has optional wheels to clean any pool surface. If you are working with smooth surfaces like ceramic or vinyl, the included PVA wheels should get enough traction. If you have more of a rough pool surface, you will want to get the optional rubber wheels. The Mirra robotic pool vacuum is covered by a one-year limited warranty. If you are looking for a good pressure side pool vacuum, then you should check out the Polaris Vac-Sweep Pressure Side. It is perfect for small to medium in-ground pools as it comes with a hose that is 31 feet long. The vacuum thoroughly cleans the walls and floor of your swimming pool, and it works well on all pool surfaces. The frame of the vacuum is covered by a five-year warranty, and the rest of the components are only covered by a one-year warranty. 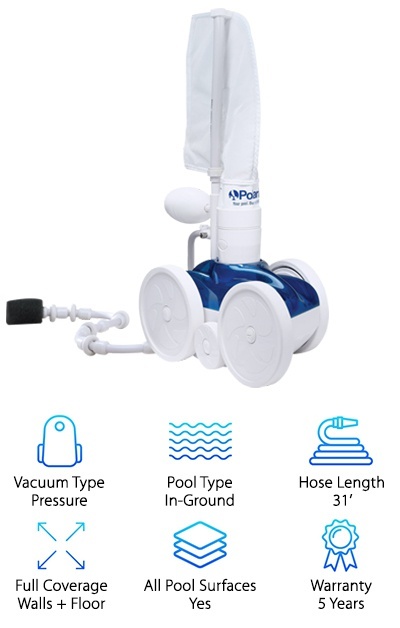 Since it is a pressure side vacuum, it connects through the hose to your pools pressure line to clean and filter the debris in its own filter bag. You will also need a booster pump to run this vacuum, which can be purchased separately. However, once you get the pump, you will be able to start cleaning your pool and with great power and speed. In fact, the pool vacuum will clean your pool in three hours or less. The best part of this pressure side vacuum is its unique filter bag. 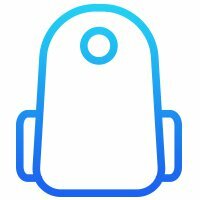 The bag will capture all small and large debris before it reaches your pool filter so your filtration system will last longer. 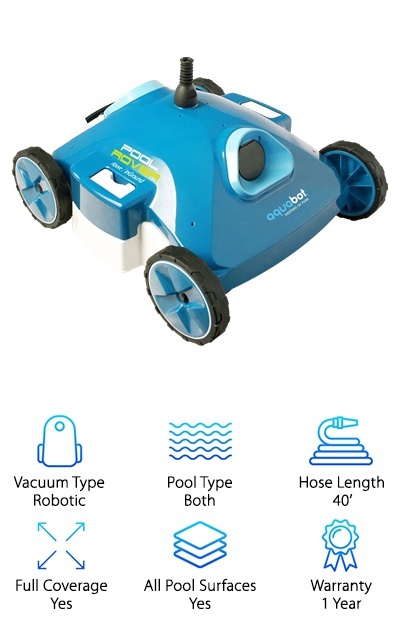 Though most robotic pool vacuums tend to be very expensive, we found a great budget-friendly option called the Aquabot Pool Rover. 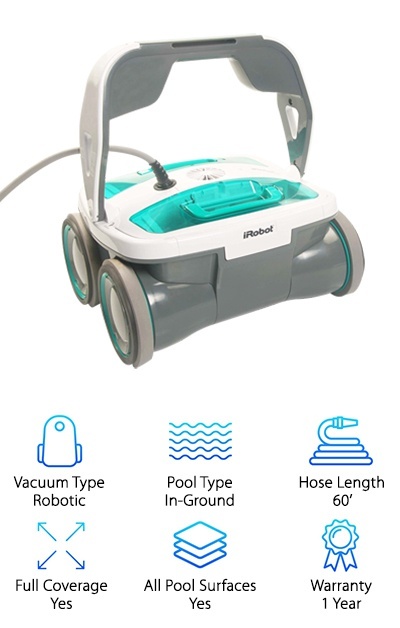 Despite being incredibly affordable, this robotic pool cleaner has a lot of versatility. While it is designed to clean above-ground pools, it also works well in small in-ground pools. This vacuum comes with a 40-feet cable, and it is capable of cleaning the floor, walls, and coves of your pool. Its sleek design allows it to maneuver around any shapes or obstructions in your pool easily. We love that this pool cleaner has great filtration and suction capabilities. In fact, it is able to filter materials down to 2 microns so you will save a lot of money on pool chemicals that would typically be needed to clean pools with small dirt particles. This vacuum is also boasted to have the strongest pump and suction power in the industry so it will be to pick up more dirt and debris. It works well to clean on all pool surfaces, and it is backed by a one-year warranty. It’s an excellent choice with a great price. The Dolphin Nautilus Plus is similar to our top pick, but it has additional features that also make it cost more. 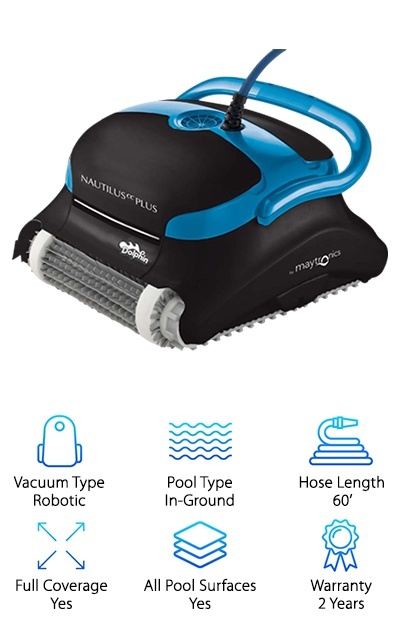 Like its acclaimed counterpart above, the Dolphin Nautilus Plus comes with a 60-feet cable, which makes it perfect for cleaning in-ground pools up to 50 feet long. It also features the swivel system that will ensure that the vacuum never gets tangled in its cables. The Nautilus Plus can clean the entire pool regardless of the pool’s surface. The robotic pool vacuum is covered by a two-year warranty. It’s fast, too, capable of cleaning your entire pool in about 2.5 hours. This vacuum is different from our top pick because of its premium features, including its extra-large top access filter. It also comes with Dolphin’s new CleverClean technology, designed to ensure that every inch of your pool is sparkling clean. 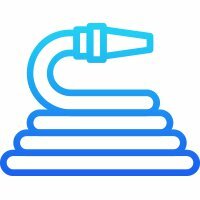 The technology helps the cleaner choose the most efficient route, but it also reduces the need to backwash your pool filter. It combines its filtration efforts to filter the water and collect debris simultaneously. 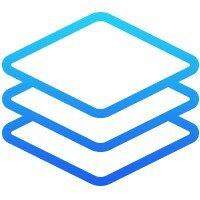 This is an excellent, simple product. You can simply plug it in, put it in the water, and let it do all of the work.